These maintenance frustrations have many owners in search of a better solution. One growing option is the use of stone solid surface shower pans – but somehow they seem a bit shrouded in mystery. In this article we’ll unmask the mystique behind this product and look at 9 questions Jenny asked me (OK – she asked even more but in the interest of time I hope you don’t mind I left a few out!) which I bet a bunch of you have as well. FAQ #1 – What exactly is solid surface? When you say the brand name Corian most people “get” what solid surface is. Corian is one trade name of a solid surface product. Basically it is a man-made stone and epoxy aggregate. The product is consistent throughout (meaning the colors goes through the entire shower base). Cultured marble shower pans are very similar to solid surface, except they have a protective gelcoat surface on the top of the shower floor. They are both durable and dense. FAQ #2 – How difficult is it to clean this type of base? The top layer of a solid surface (or cultured granite) pan is made of a tough, clear stain resistant resin which is polished with high speed buffers in the manufacturing process. This top surface allows cleaning to be simple. Just take a cloth or sponge and wipe off with your favorite non-abrasive cleaner. FAQ #3 – Is the base slippery? Can it withstand a lot of weight? 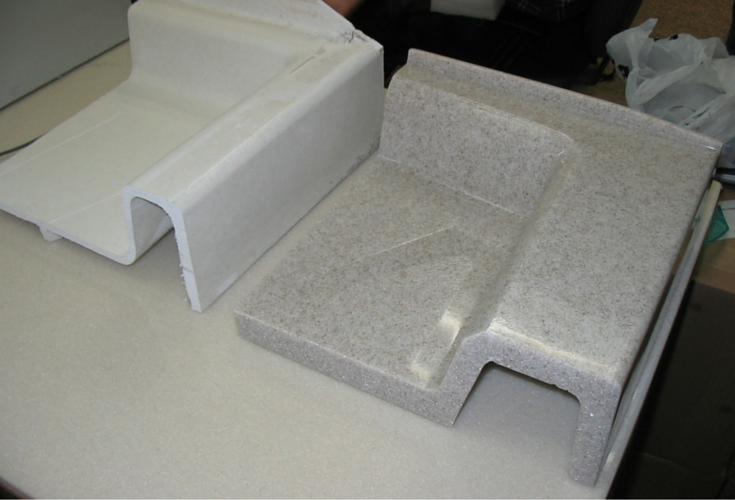 Solid surface or cultured granite shower pans – whether they are made in standard sizes of custom shapes have a non-slip pebbled texture at the bottom. This texture makes it safe. The fact that it is solid throughout makes it so it won’t bend and deflect like a fiberglass or acrylic shower pan (note – unless the acrylic pan has a supportive MDF surface underneath it). It is a superior product when you need a solution which can support a good amount of weight. FAQ #4 – Can I get a ramp? Yes – not only can you get a single ramp you can even get a double ramp for entry on 2 sides. Since the material is solid throughout you will feel more secure rolling into the shower with a wheelchair and/or transferring into a solid surface shower bench seat when inside. 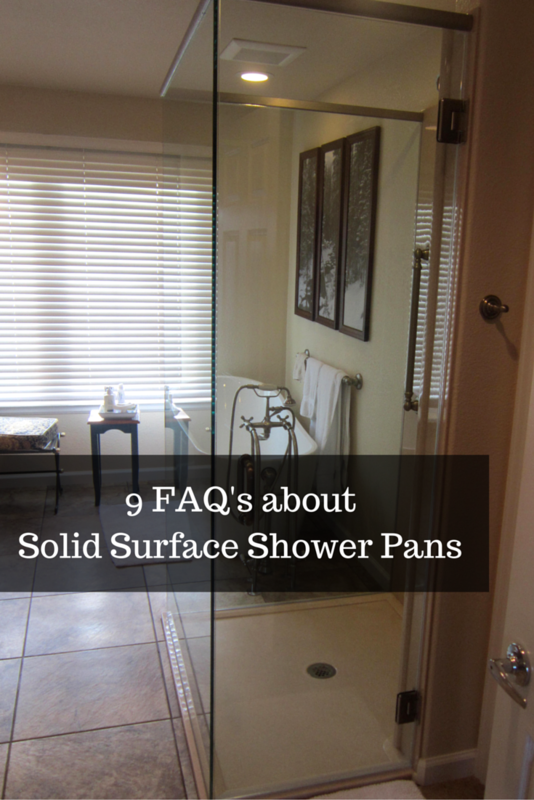 FAQ #5 – What’s the guarantee with solid surface shower pans? It depends on the manufacturer. Some have a lifetime guarantee, others you’ll find with a 15 year guarantee. In either case, these bases are built like a tank and won’t last (unless you have an earthquake – or a crazy natural disaster). 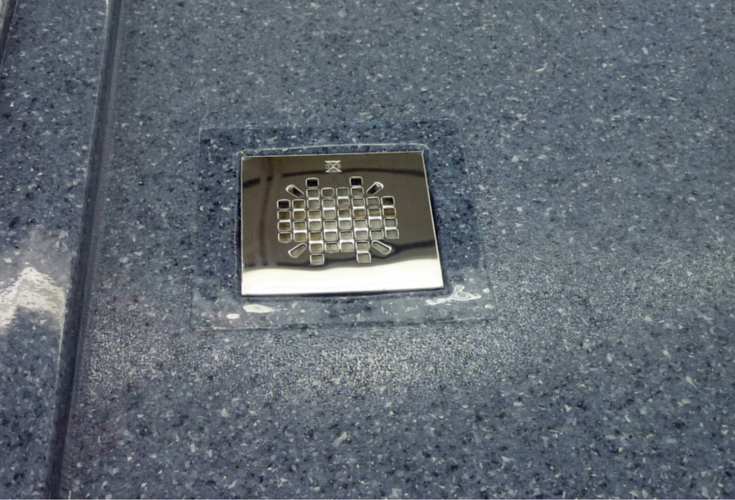 FAQ #6 – Can a solid surface shower pan be made with a custom size, a custom drain location or does it only come in standard sizes? In bathroom remodeling projects the needs to customize is often paramount – and as you know if you own an old home it seems that nothing was made “standard” – and you’re paying for it now. With that being said you can get virtually any custom shape. How about a curved curb for a glass block wall? A curved front base? A base with an odd drain location so you don’t have to sweat the effort (and cost) to move the plumbing. If you need a custom shower pan, you’re in the majority of the people I talk to. While customization is possible, it’s best to see if there is a standard size first that would work. Custom bases tend to cost 30-40% more than the standard pans. FAQ #7 – What type of glass enclosure can I use with a solid surface pan? Basically any type of enclosure you want. 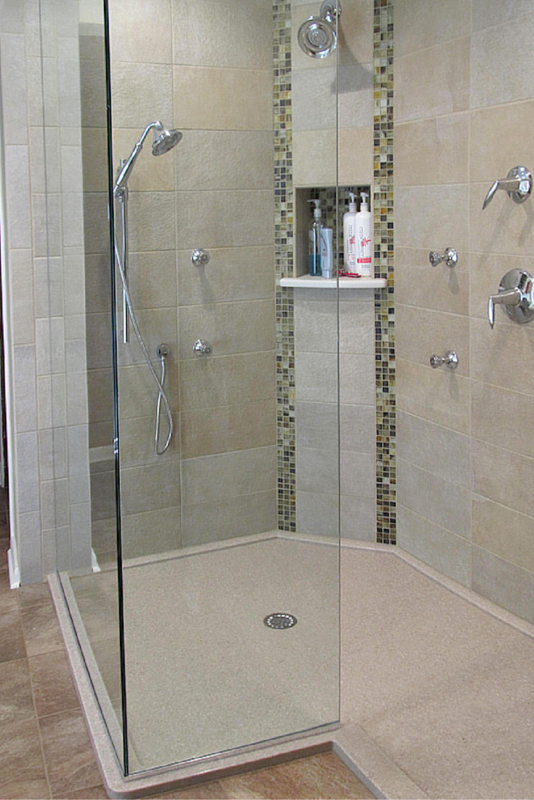 If you want a NEO angle corner shower you can get a base and the glass to match in several standard sizes. 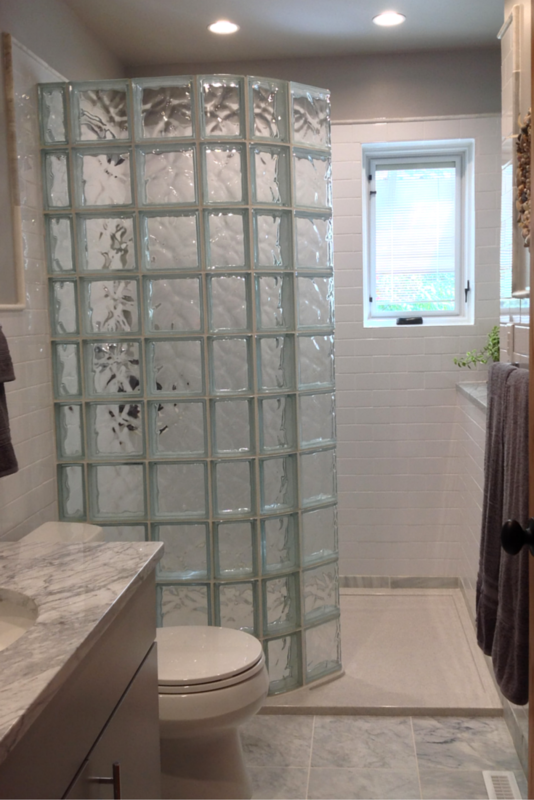 You can select a frameless, semi-frameless or framed glass system to pair up with your base (note in many cases there are pre-packaged glass, wall and base shower kits available so you’ll know everything works together). Even if you want a curved walk in glass block shower the pan can be shaped to “get ‘er done” as Larry the Cable Guy might say! FAQ #8 – Can a solid surface pan be altered if someone in my family needs the assistance of a walker or wheelchair? Modern medicine has helped us live longer but unfortunately our bodies don’t have the same mobility as in our younger days (ask any wife whose 45 year old husband is still playing softball). The need for a shower pan which can be changed down the road for a family member with less mobility can be a HUGE benefit. Most standard pans have a 4-5” curb to step over. When we’re younger this curb is no big deal, but as we get older this could become an insurmountable mountain. What is important to know about solid surface pans is if you select a low threshold (which has a 1 ½” high curb) and then you need a fully ramped solution (maybe Mom or Dad are going to come live with you and they need this functionality) then a ramp extension kit can be added to the pan. This feature makes “aging in place” (a term I personally hate) possible, helping to save families substantial costs associated with nursing or assisted living facilities. FAQ #9 – What color are available in these pans? In one line we carry there are 56 standard colors of solid surface shower pans. In another line there are 24 colors of cultured granite shower bases. You won’t find it challenging to match your bathroom décor. 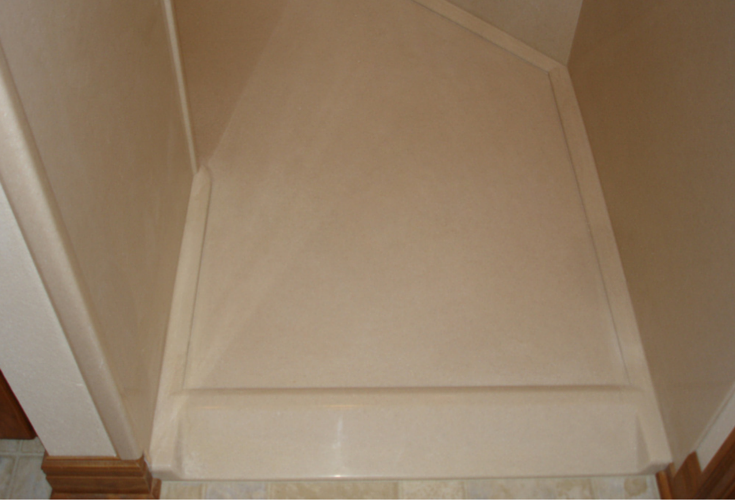 Solid surface shower bases are available in gloss granite and matte finishes. OK – how did I do? Did this article answer your burning questions about solid surface shower pans? Is this product a good choice for your home? Please comment or call the numbers below to get more information about solid surface bases, wall panels or complete shower kits with glass enclosures. For more information or an estimate on remodeling a shower or nationwide material supply for the various wall panels and solid surface pans call The Bath Doctor in Cleveland (216-531-6085), Columbus (614-252-7294) or for nationwide supply Innovate Building Solutions (877-668-5888). I just finished a beautiful new tile shower with a Corian pan base & bench. Absolutely love it! The Corian is wonderfully smooth on my feet & backside when sitting but not slippery at all. Super easy to keep clean! Very very happy with it! The market.. your article was informative.